With hardly any notice, foolish and plain housekeeper Johanna flees her employer and sets off to find the man she's fallen in love with. Little does she know that her correspondence with him has a complete fabrication, a cruel teenager's idea of a practical joke. So, who will Johanna find when she steps off her train with the household furniture in tow? Alice Munro is the universally celebrated master of the contemporary short story, the Chekhov of our time. Nowhere are her powers better on display than in this exquisitely crafted story exploring the wonderful and unexpected places where love, or the illusion of it, can lead. 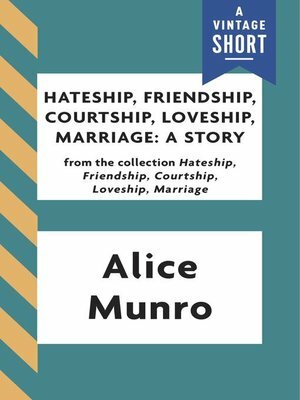 This selection is the title story of Munro's acclaimed collection, Hateship, Friendship, Courtship, Loveship, Marriage and the basis of the 2013 film, Hateship Loveship.